Supervised by China National First Class Erhu Performer, Song Fei. Known as the "Queen of Chinese Folk Music", Song Fei worked with experienced Erhu Master Maker Zhang Zhong and Zhang Jun to handcraft this exquisite quality Erhu with Premium Antique Aged Rosewood (明清舊料). With better stability and resonant structure, Premium Antique Aged Rosewood is an excellent tonewood material for Erhu making as the fine structure of tonewoods becomes drier and more rigid over time. 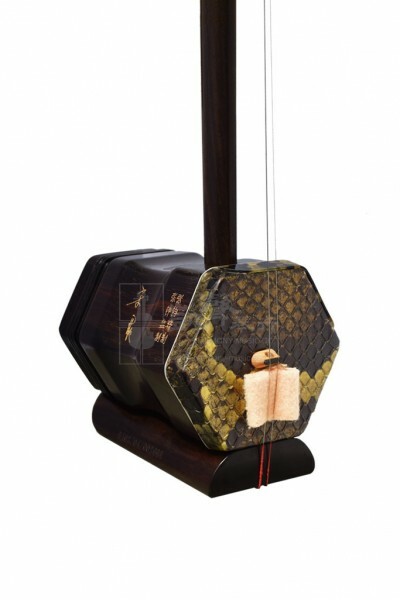 Consisting of exceptional resonance, rich and complex sounds from the inner string, sonorous and projective trebles and agile responses, this Beijing Premium Antique Aged Rosewood Erhu by Song Fei combines the features of Northern and Southern Erhus styles and is the designated performance Erhu for many Erhu Professionals. Traditional, as well as rustic aesthetics, this Erhu is well-equipped with a bow, a spare string set and bridge, a rosin and a case.